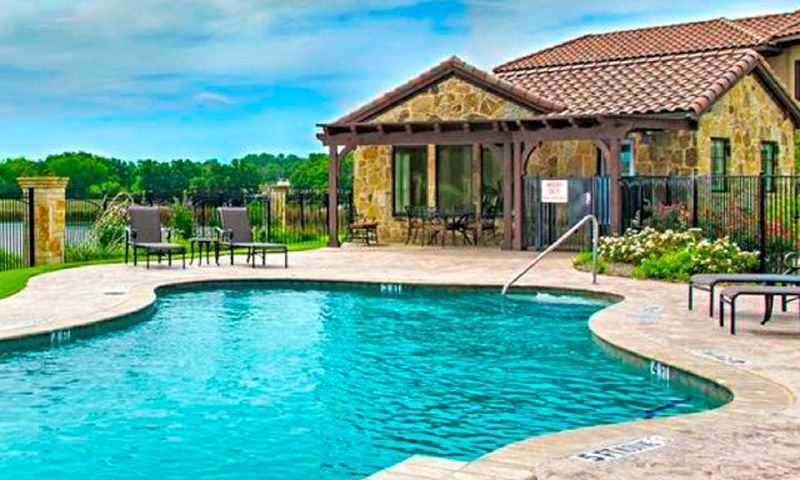 Tuscan Hills is an active lifestyle community nestled along Unicorn Lake in Denton, Texas. This quaint community was started in 2013 and upon completion it will consist of 106 homes. The lifestyle, quality of homes and world-class amenities appeal to today’s discerning homebuyer. Whether you are looking for a lock-and-leave or permanent residence, Tuscan Hills is a perfect place to call home. Tuscan Hills has a charming Italian-style clubhouse that is the hub for all social and physical activity. It gives residents the chance to exercise their bodies, expand their minds, engage in hobbies and make new friends. Residents can work out in the fitness center, join neighbors in the multi-purpose room, take a dip in the outdoor pool, or soak up the Texas sun on the outdoor patio. In addition, residents can embrace the breathtaking views of Unicorn Lake while strolling the trails throughout the community. Construction of Tuscan Hills began in 2013 and upon completion plans to have 106 single-family homes. Homes within this gated community range in size from 1,900 to 3,032 square feet and feature three or four bedrooms, two to three-and-a-half bathrooms, and an attached two-car garage. All homes have open floor plans with first-floor master suites. The charming aspects of the stone-front homes and Italian style makes it easy to fall in love with Tuscan Hills. The amenities and desirable low-maintenance lifestyle make this an ideal community. A reasonable homeowners’ association fee covers general maintenance of the community clubhouse and common areas. Exterior home upkeep is also taken care of with lawn maintenance allowing residents more time to enjoy all that the community has to offer. Tuscan Hills is located in Denton, Texas off of Unicorn Lake just five miles south of downtown Denton. This prime location makes traveling easy with Interstate 35 and Highways 121 and 380 within minutes of the community. Dallas Fort Worth International Airport is also only 30 minutes away. Tuscan Hills offers easy access to shopping, Denton Regional Hospital, University of North Texas, and Texas Woman’s University. Tuscan Hills is also conveniently located near Lake Lewisville and an abundance of recreational opportunities in downtown Denton. Tuscan Hills is close to everything, but far enough away from the everyday hustle and bustle, making it an ideal active lifestyle community in Denton, Texas. Check back soon for more information on the lifestyle in Tuscan Hills. Construction of Tuscan Hills began in 2013 and upon completion plans to have 106 single-family homes. Homes within this gated community range in size from 1,900 to 3,032 square feet and feature three or four bedrooms, two to three-and-a-half bathrooms, and an attached two to three-car garage. All homes have open floor plans with first-floor master suites. The charming aspects of the stone-front homes and Italian style makes it easy to fall in love with Tuscan Hills. We've been fortunate to retire young and just bought a home here last summer. We were attracted to the floor plans here and the nice clubhouse. It's a small, private neighborhood plus it is gated so it keeps down the thru traffic. After living on a busy street for years it's nice to finally live in a quiet neighborhood. The quality of construction in our home exceeded our expectations and the clubhouse is fantastic. We also love the lake and walking the trails. 55places.com is not affiliated with the developer(s) or homeowners association of Tuscan Hills. The information you submit is distributed to a 55places.com Partner Agent, who is a licensed real estate agent. The information regarding Tuscan Hills has not been verified or approved by the developer or homeowners association. Please verify all information prior to purchasing. 55places.com is not responsible for any errors regarding the information displayed on this website.